Deficiencies can appear due to a range of things, whether that's under or over watering or lack of an essential nutrient. 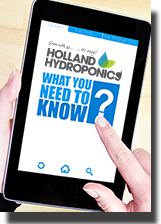 At Holland Hydroponics we stock various nutrient supplements to help you with deficiency correction, improving your plants health and getting growth back on track. Unlock true genetic potential with this ideal ripening solution. Made to accentuate terpene production and recycle the last remaining energy left in the plant towards bulking fruit development. The winter like effects can be see through exuberant oil production, and immense purple, red, and burgundy coloration shifts. When dosed properly, the affected plant system uses its remaining energy to defend against frost and ensure swollen fruit pods are available for next years sowing. An invigorating plant tonic brimming with some natural ingredients such as alfalfa meal and kelp seaweed extract. Emerald goddess contributes macronutrients, vitamin B1 and humic acid which may increase uptake. This formulation encourages strength and vitality in your high-yield gardens. VEG + BLOOM DIRTY acts as a carbon balanced, nitrate infused based nutrient that helps with all phases of plant growth. Dirty is formulated specifically for soil and peat-based growing mediums and is rich in amino acids and refined organic materials. VEG + BLOOM RO/SOFT is perfect for all hydroponic applications e.g. coco and rock wool. V+B is specially formulated for soft water and contains everything in a one part powder as opposed to other liquid multi-part nutrient's. The Shogun Fertilisers Samurai Coco Multipack has absolutely everything you need to get a coco grow done from start to finish. The Shogun Fertilisers range has been developed by leading bio-chemists. Give your plants a mineral boost with Canna Single Mineral Additives. Canna Mineral Trace Mix contains several trace elements that are used for several enzyme systems, thus essential for the development of your plants. The mineral fertiliser is suitable as a supplementary nutrient to stimulate growth and bloom of plants. This mix can prevent deficiencies from happening, and clear up any that are already occurring. A lack of the essential elements will cause slow plant growth, discoloured leaves and a generally unhealthy plant. Mighty Growth Enhancer gives a continuous release of nitrogen, helping to combat any deficiencies in this essential element. The slow-release from this veg booster encourages faster, greener and healthier growth. Bio Nova The Missing Link is a premium product designed to fix nutrient deficiencies and help protect the plant throughout both vegetative growth and flowering.